Coming from a background in radio, I’ve always viewed audio storytelling as an incredibly immersive medium. Putting on a pair of earphones and listening to my favorite podcasts always meant that I would be experiencing something new; I’d visit places I’d never been to or heard of, meet interesting characters and more, all from the comfort of my room. Sound, mixed creatively and powerfully, meant that the imagining, meeting, and traveling all happened inside my mind. To me, this was the epitome of immersive storytelling. But when I joined Contrast, Al Jazeera’s immersive media studio, as an intern three months ago, I was introduced to 360/virtual reality journalism and filmmaking, and the world of immersive storytelling suddenly expanded. My understanding of 360 video, prior to getting involved with Contrast, was pretty simple: it was all about the location. Through a static camera, VR filmmakers can take you to places difficult to access. I quickly realized that there was more to it than taking viewers where they couldn’t go. While it holds the visual upper hand, virtual reality, similarly to audio stories, has the power of making you feel like you’re a part of another world — where, for a moment, everything around you fades away as you become a part of someone else’s story. For example, a few months ago, Contrast released ‘The Curse of Palm Oil’, a virtual reality documentary that captures the impact of deforestation on the unique culture, lifestyle, and livelihood of the Orang Asli, Peninsular Malaysia’s indigenous people. 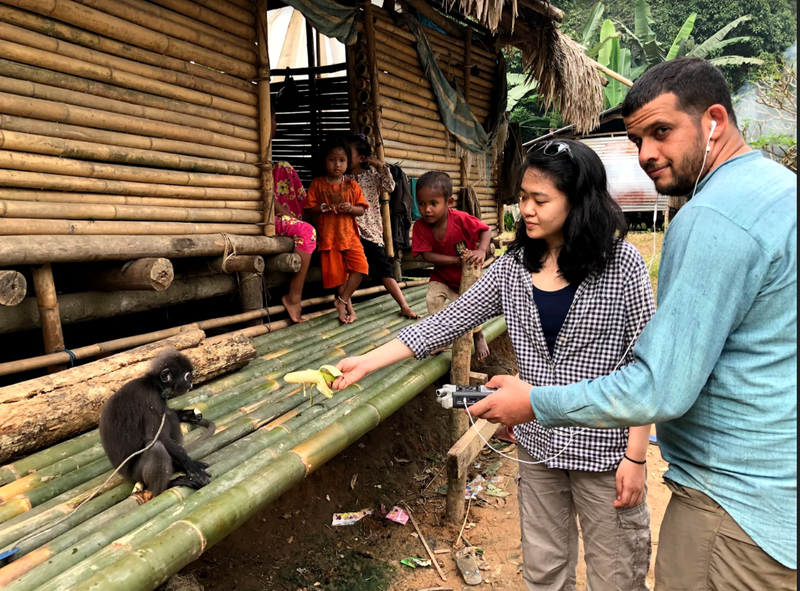 The 360 shots of the staggering scale of deforestation are well suited for a virtual reality film, as the visuals were an integral part of being able to show the Orang Asli way of life in an authentic way. The Curse of Palm Oil, however, also employs spatial audio to create a more powerful, immersive experience. 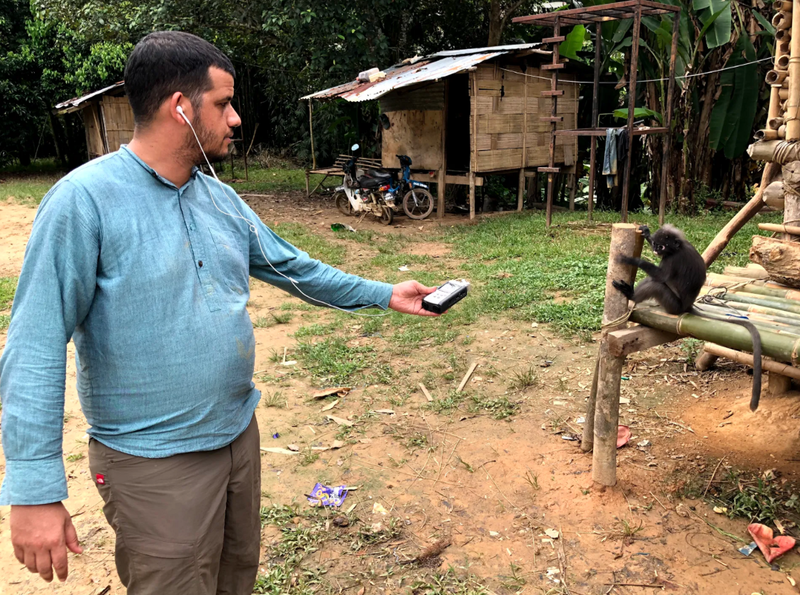 The audio in the film acts as a guide for the viewer, from the homes of the Orang Asli, to the forests that are still standing, to the cleared lands and then back home. The rich sounds of the forests, when juxtaposed with the hollowness of cleared lands, provide a shocking clue to viewers of what’s already been lost — and what could be lost if deforestation continues in the region. The presence and creative utilization of audio throughout the virtual reality documentary helps shape a deeper sense of immersion, a more instinctive connection to the story. This made me wonder: what role does audio play in VR storytelling, and what audio storytelling techniques could be adapted for VR experiences? Both the audio and VR storytelling mediums are incredibly immersive on their own, but how can their techniques complement each other? To find out, I sat down with Graelyn Brashear (a producer with JETTY, Al Jazeera’s audio network) and Viktorija Mickute (a producer with Contrast, Al Jazeera’s immersive studio), to learn about the techniques they use to make their mediums more immersive. First, what’s so special about audio? Second, what does it take to create an immersive audio story? I then sat with Contrast’s producer Viktorija Mickute who directed The Curse of Palm Oil, to hear about the ways she used audio to create additional layers of immersion in virtual reality, many techniques which sounded familiar to podcasting. Through these conversations, it is clear that audio plays — or should play — an immensely important role in virtual reality documentaries. In order for virtual reality films to expand its immersive potential, it has to go beyond relying on powerful visuals and compelling stories, and also embrace audio as a medium considered not a supplement to visual storytelling, but a complement. Most of the audio techniques used by podcasters were already being organically explored in Contrast’s virtual reality documentaries. Both approach the method of creating soundscapes similarly. Invoking a sense of presence in a different space doesn’t come simply from capturing ambient sound, but paying attention to the details that combine to create the wholistic sound. Both Graelyn and Viktorija recorded tiny components of sounds and then layered them in post production to capture the full richness of the place. Both also speak to the power of crafting audio narration as a beautiful and intimate way to guide the viewer’s experience through the story. While Graelyn discusses it as a mechanism to ‘fill in the gaps,’ in podcasting, Viktorija views it as a way to connect the viewer to the visuals around them. In many ways, audio can play an even more versatile role in VR documentaries. While using the same techniques necessary for immersive audio storytelling (detailed above by Graelyn), audio in VR storytelling goes further by working in relation to the visuals. For example, in The Curse of Palm Oil, the use of creating two storylines — one through audio, and the other through the 360 shots — created another layer of tension in the film, as the audio was used as a plot device pitted in direct contrast to the story being told visually. While we tend to instinctively tie the immersive quality of VR to the strong visuals and the ability to transport viewers elsewhere, we can do so much more if we use audio powerfully, in a way that creates a more realistic experience that mimics what viewers would see and hear if they were, say, standing in the middle of a forest. By appreciating both audio storytelling and virtual reality for their strength(s), we can figure out how to fuse those worlds together to tell not only a good story, but the best story. Al Jazeera's immersive media arm that specializes in using 360 video, virtual reality, and innovative technology to tell compelling character driven stories.